When he heard about the plans to invade the Magic Isles, Slikver knew that traditional Garheim fighting styles wouldn't hold up in the vastly different landscapes of the island. He took his men to the south to train in the open fields just outside Ayleth castle. Slikver belives training heavy calvary is essential to being able to run down the hordes of outlawsa that will no doubt try to defend the islands. Here he observes his heavily armored knights charging down the grassy plains in a wedge formation. 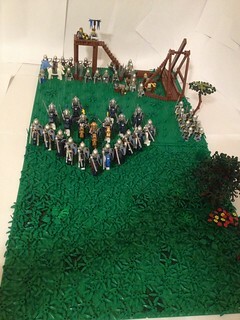 The land is also being used for training grounds by the infantry and siege units. Great scene TM! I think you're right, horses are quite superior to infantry. Yeah! I mean as long as the outlaws don't have pikes or spears... then of course! Mark of Falworth wrote: Great scene TM! I think you're right, horses are quite superior to infantry. No they're not!! Just awesome man! I really like the formation those Knights are in!! It depends on the terrain, Mark. I'd like to see how your ponies do in the rocky foothills near Mikithdar. Great story and good execution. I love that "flying vee" formation! Cavalry can be very powerful but should never be allowed to be brought to a standstill (for too long), should always attack on the flanks and never charge in unsupported. Back to the build, I'm impressed by the amount of crown knights and leaf pieces you have and the formation does indeed look splendid. Last edited by Sir Bragallot on Thu Jan 31, 2013 4:29 pm, edited 1 time in total. ontopic: Nice set of troops, good posing and well done terrain ! Okay, they've learned how to fight, now... "To war!" I love it! I always have liked calvary! I'm really liking this scene! It is a great take on the contest.